Erlinda can’t sleep: tomorrow her childhood will be over and she’ll be a Flyer. She’ll leave the nest where she’s been raised with her age group; new winglets on her ankles will enable her to fly, and she’ll know what her mission is. Erlinda lives on the planet Mercurium, to which her human forefathers migrated from Earth. They set up a colony, protected by a special dome, and have developed the ability to fly. But not all the migrants joined the colony: outside the dome live the Grounders, those humans who refused to develop winglets and are ground-bound. The Flyers see them as enemies and stay away from them, but they need a spy to go into enemy territory. Much to Erlinda’s surprise, and against her will, this is Erlinda’s mission. Erlinda has always known that she’s different—there’s a rumor that her parents were traitors, and she doesn’t know what happened to them. Now she discovers that only she can be a spy, because she can make her winglets invisible. So, after training, she sets out for the unknown, leaving behind her beloved Omine. Yet Omine, a graduate of a military academy, will lead the attack against the Grounders. Nobody knows about his doubts, or his love and fear for Erlinda. Although Taking Wing takes place in a distant, imaginary galaxy, this clever and gripping novel deals with issues that concern us in the here and now. Huan B. Landi is the pseudonym that Nava Semel has chosen for her new trilogy--she feels that her new venture as a fantasy writer requires a new authorial identity. 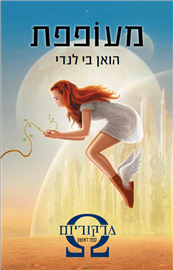 A highly imaginative Israeli author … The book is replete with imagination and thought-provoking ... [Nava Semel] creates a wondrous world, including a made-up mythology that supplies a fantastical escape in every sense from the difficulties of adolescence.